Giving up is easy. Anyone can do that. People do it all the time. I do it. All of us do. We surrender. We throw out the next possible opportunity sometimes, simply because we fell down in some way or another, or because someone else finally wore us down with their repeated message that we couldn’t succeed. Surrender is practically a national sport, it seems. The key to a successful surrender is not to stop taking action toward a goal. A spiritual surrender takes courage. The act of surrendering self will, without giving up on the action is the work. The ego in all of us will rarely support action taking course outside the realm of our own thinking, perception. There are many times in life that events will take course in ways that we can not grasp as right, do not accept as possible; therefore, we quit. Persistence is not the friend of the little one that takes the ball home, for everyone will not play the game by only his/her rules. We live in a large world, with many cultures and a plethora of perceptions. Being able to rise above and meander through all of this that is at our fingertips in this new age of instant information will be the gift of the successful soul in the game of persistence. 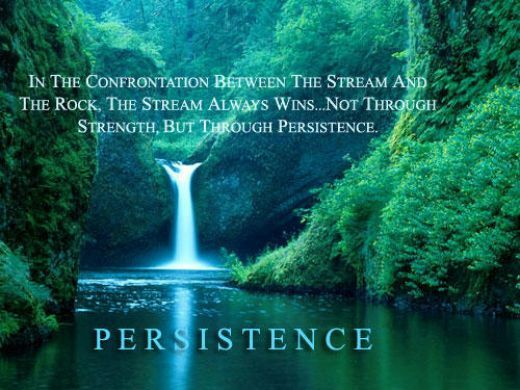 Persistence, however, is a trick worth nurturing. If you can keep at something, if you can find and rekindle that little spark of faith that you’ll figure it out, then you can rebuild again and again. Persistence is the act of building continuity. It’s the deliberate action of doing something, doing it again, doing it again, until you get it right, and maybe doing it over and over after that, too. Filed Under: WOMEN "Positive Action" Tagged With: A Celebration of Women, Action, continuity, perception, persistence, PERSISTENCE thrives through SURRENDER, spiritual, SURRENDER, women.